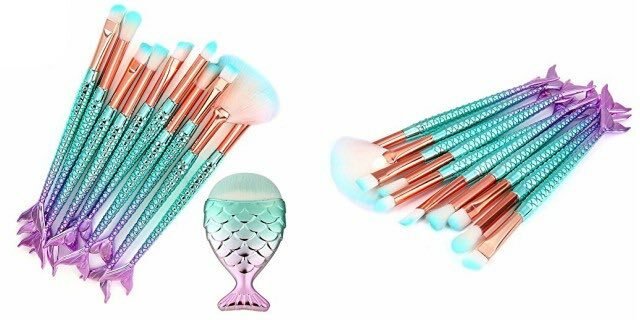 11-Piece Mermaid Make Up Brushes Set Just $8.99 Shipped! Sale on 11-Piece Mermaid Make Up Brushes Set! Head over to Amazon for another great deal! Get this 11-Piece Mermaid Make Up Brushes Set for just $8.99 shipped! That’s only $0.81 per makeup brush! These adorable mermaid brushes would be a great gift for your little girl’s Easter Basket. Surprise her with her very own makeup brush set! Each brush is handmade with premium synthetic fiber materials for flawless face and eye makeup application. Use for all types of makeup including blush, blending, contouring, shading, eyeshadow, eyebrow, concealer, and more. Plus, they even offer a 30-day replacement or money-back guarantee! Get this 11-Piece Mermaid Make Up Brushes Set for just $8.99 shipped! Isn’t that great?! These handmade brushes made of premium synthetic fiber materials will give you a flawless face and eye makeup application. Also, these brushes are great for all types of makeup: blush, blending, contouring, shading, eye shadow, eyebrow, concealer, and more. You will not want to miss out on these savings! Sign up for a free trial of Amazon Prime, Amazon Family or Amazon Student and get free 2-Day shipping! **Buy this 11-Piece Mermaid Make Up Brushes Set for just $8.99 shipped! Previous articleNew Arizona Boots, as Low as $15.99! Next articleInsignia 6-Quart Multi-Function Pressure Cooker Only $39.99 Shipped!